My colleague Josh Bivens and I recently published a briefing paper analyzing the near-term macroeconomic impacts of the Obama and Romney budget proposals based on prevailing actionable evidence. (Short summary of findings here.) Our verdict was that Obama’s budget plans would lead to increased employment of 1.1 million jobs in 2013, relative to current policy, whereas Romney’s proposals would lead to small job gains of 87,000 in 2013 if all his proposed tax cuts were deficit-financed, but lead to job losses of 608,000 in 2013 if only some of his tax cuts were deficit-financed. This latter estimate assumed Romney’s proposed 20 percent reduction in individual income tax rates and alternative minimum tax (AMT) elimination would be revenue-neutral, whereas his earlier proposals—notably cutting the corporate tax rate and eliminating the corporate AMT, taxes on foreign profits, the estate tax, and Affordable Care Act taxes—would be deficit-financed. 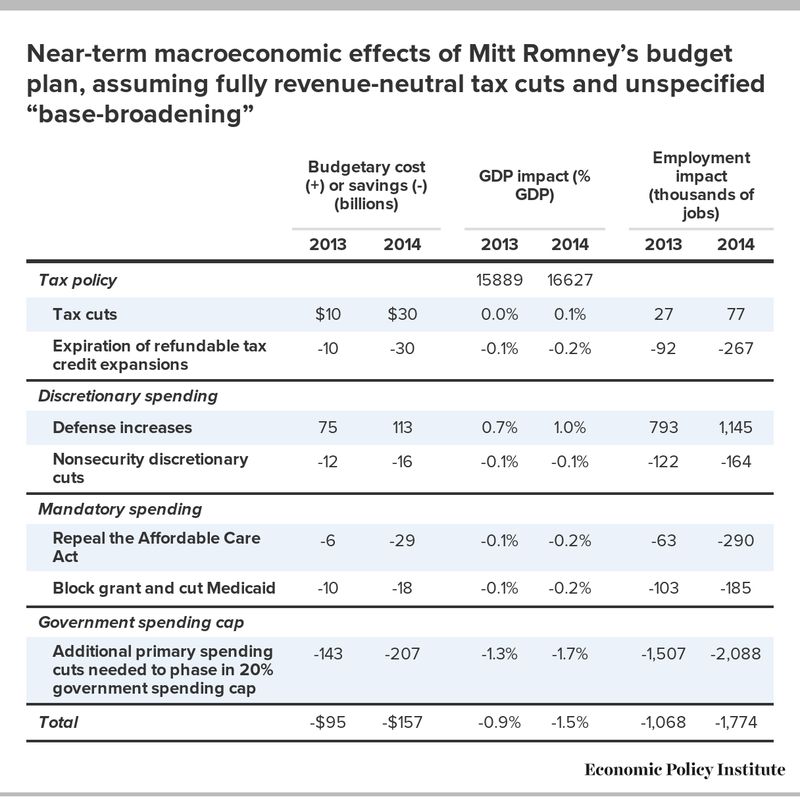 While regressive tax cuts are really inefficient at boosting growth, enough money plowed into inefficient tax cuts will modestly boost demand and, short of “base-broadening,” (none of which has been concretely specified) Romney is proposing a lot of costly tax cuts. Our estimate of 608,000 job losses in 2013 assuming partially deficit-financed tax cuts was net of 492,000 jobs being supported by $196 billion in deficit-financed tax cuts. Taking Romney at his word that all his tax cuts will be paid for, the Romney budget would slow real GDP growth by 0.9 percentage points in 2013 and 1.5 percentage points in 2014. Correspondingly, we estimate that total revenue-neutrality would result in even bigger employment losses of nearly 1.1 million jobs in 2013 and 1.8 million jobs in 2014, relative to current policy (see Table 4). 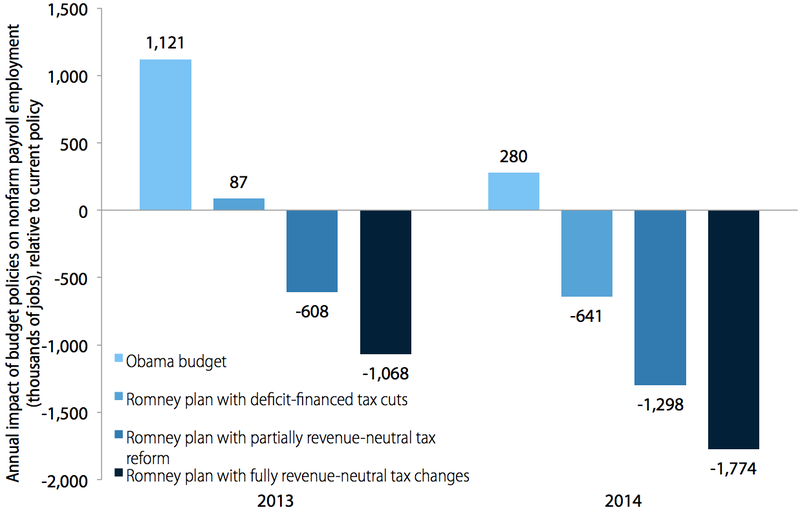 Compared to fully deficit-financed tax cuts, this version of Romney’s plan would result in 1.1 million fewer jobs in both 2013 and 2014 (see Figure B). Note: This figure presents the impact in calendar years 2013 and 2014. This is not to suggest that a fully deficit-financed tax cut is preferable—even though it has a much better job impact, it does so at an extremely high cost: $455 billion in 2013 and $486 billion in 2014, because regressive tax cuts offer such inefficient economic support. By contrast, the same economic boost of these deficit-financed tax cuts could be achieved at less than one-fourth the cost with well-targeted stimulus such as unemployment benefits, nutrition assistance, state and local fiscal relief, and infrastructure investments. 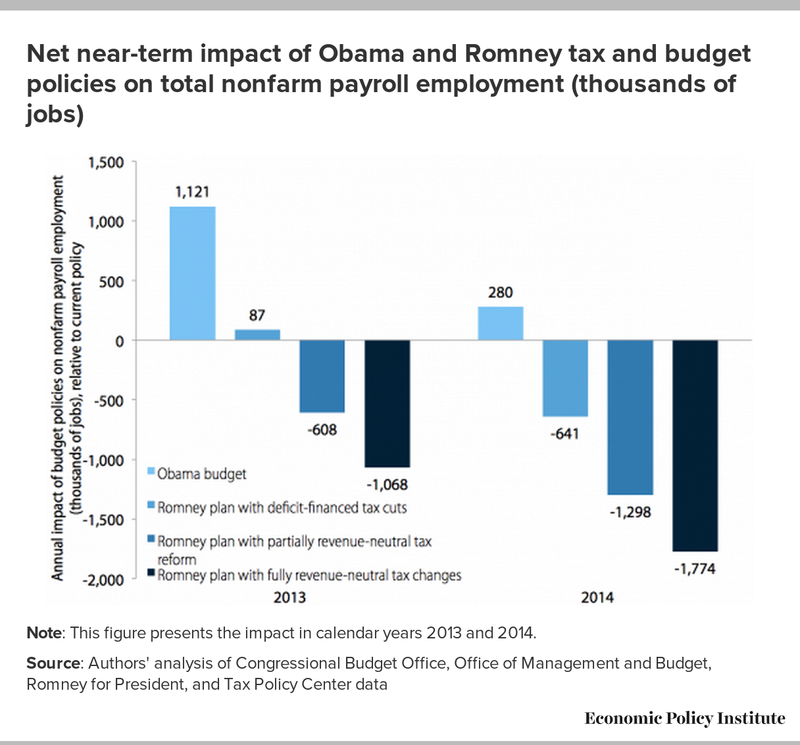 The bottom line: Under the Obama budget plan, employment would be nearly 2.2 million jobs higher in 2013 and 2.1 million jobs higher in 2014 relative to the Romney plan with fully revenue-neutral tax changes.